Coca-Cola Santa Disk | Coca-Cola Figurines | One Price Low Flat Shipping! 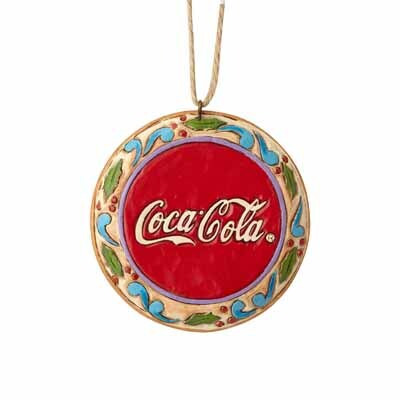 From the Jim Shore Heartwood Creek Holiday Collection, Coca-Cola Santa Disk Ornament. Made of hand-painted stone resin. Measures 3" tall. Comes with hanging cord attached and packaged in collectible Enesco Jim Shore gift box. Its the pause that keeps him going! 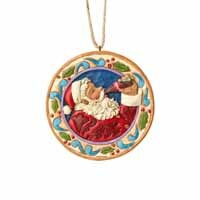 Sundblom Santa, styled in iconic velvety red Santa suit with a white fur trim, a thick, snowy beard, and a jolly face, enjoys a refreshing vintage glass bottle of Coca-Cola in this stone resin ornament by Jim Shore. Deep colors and vivid details lend a lavish feel to the handcrafted design, hand-painted for a flawless finish.